TechTraveller: Apple iPhone Nano: Hoax or Reality? Hi everyone! What you are reading here is My space on BloggerWorld...ull get to see my views on topics and events ranging from News, tech, Media to sports, news, gossip, fun and anything that Id want to put in here! Feel free to read along and do post ur comments and replies...Happy reading! Apple iPhone Nano: Hoax or Reality? Theres a lot of storm brewing over whether Apple is bringing out a 'Nano' version of the iPhone. The thought obviously has followed Apple's trend with the iPod. In this post I will analyse the fact sheet as stated by several sources. News reports began appearing yesterday(09/Jul/07) that Apple may be planning to build a cheaper and smaller version of the iPhone, following the slim and sleek modeling design of the iPod nano. According to reports, Apple is silent on the subject. About two weeks ago (the night before the iPhone was available in stores) David Letterman did a skit on his CBS program which featured an iPhone sneak peek. According to Dave, the nano version would not be cheaper. On his broadcast he stated the nano version would be $1100. You can watch a clip of Letterman's skit on youtube. LONDON — Apple Inc. (Cupertino, Calif.) is working on a second iPhone, based on the form-factor of the iPod Nano music player, according to online reports that reference a note to clients written by J.P. Morgan analyst Kevin Chang. 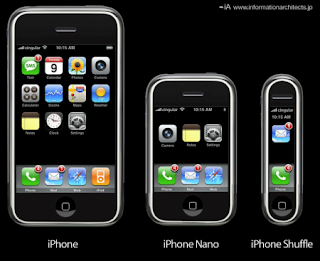 The iPhone Nano would be much lower cost than the iPhone and come to market in the fourth quarter of 2007, the reports said. 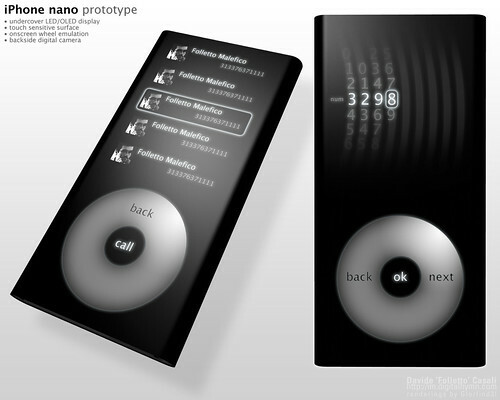 Chang expects the iPhone Nano to have a scroll wheel interface, limited functionality and be priced at about $300. Chang concluded that Apple could potentially ship 30 million to 40 million units of the iPhone Nano in the 2008 financial year, the report said. Alright, if there's a fire, there has got to be a spark behind it. This might be it: Apple submitted a patent today that could be direct evidence that a downscaled Nano-like iPhone is in the works. Here is the patent application for you to see. An Apple patent application dated Thursday has sparked speculation among bloggers that the computer maker may be planning an iPhone light that would focus only on voice communications and music. "The invention pertains to a user interface for controlling an electronic device, particularly a multifunctional device that is capable of operating in multiple modes as for example a phone mode for communications and a media player mode for playing audio files, video files and the like"
I dont really know whether the iPhone Nano is in the works or not, but id definitely say that if it is, this patent application is not the clue to it. After Having revolutionized the gadget industry with its touch interface, I wouldnt think that the rotary interface would be such a big indication towards iPhone Nano. Chances are Apple is simply patenting all embodiments of iPhone knockoffs so a few hacks in Japan and China don’t get silly with themselves. Lets wait and see if, when and how Apple chooses to surprise us! MAC OS-X: The Greatest Operating System Ever? Face search over the Internet!